Spring City Aviation offers high-quality, safe and professional flight training services at all three of our Southeastern Wisconsin locations. Simply select the location most convenient for your training needs, and we’ll take it from there! Below, find some Frequently Asked Questions about flight training. Contact us today to begin your journey toward becoming a pilot! How long has Spring City Aviation been in business? Spring City Aviation has been in business since 1996. From its humble beginnings as a two-man operation, Spring City has grown to become one of the largest flight school operators in Wisconsin. On a yearly basis, more than 100 students complete one or more of the training courses offered. The school was established for the purpose of training pilots to a level exceeding the standard, and this continues to be our highest priority. Why should I take lessons at Spring City Aviation? We want what you want – for you to enjoy the flying experience and become a safe, conscientious pilot. We handpick our instructors, and hold them accountable for the quality of students they turn out. Our business has grown by the most effective advertising method available – word of mouth. Flight training is our primary business, so we have to do it well or we won’t be around long. It is important to realize that the FAA requires a minimum of 40 hours for the Private Pilot Certificate. These are the absolute minimums. While a handful of students may complete the course within this time frame, many will find themselves accumulating 60-70 hours of flight time before acquiring their certificate. The total time is dependent on several variables. A higher frequency of training will generally enable you to obtain your certificate sooner, and with the least expense. We recommend a minimum of one lesson per week, however it will be to your advantage to fly 2-3 times per week, thereby retaining more information between flight lessons, and requiring less review time per session. Other variables would include weather, age, natural aptitude, finances, and commitment to home study. Completion of the course can take anywhere from 3 months to 2 years. When can lessons be scheduled? Excluding national holidays, Spring City Aviation is officially open 7 days per week. However, we will schedule lessons whenever it is convenient for you: Day or Night, Summer or Winter. In fact, it is often required to fly at night to satisfy the regulatory requirements for your certificate or rating. How are flight lessons structured? Generally you will schedule a two or two and a half hour flight lesson with your instructor. This provides adequate time for a pre-flight briefing, the flight lesson itself, and a post-flight critique without having to rush from one student to the next. The lessons are structured around your abilities and schedule, but we do follow a general syllabus, which provides a logical sequence for the training. How do I choose an airplane in which to train? The airplane you use for training will depend on your comfort and finances. For students not limited by size, a Cessna 152 (two seats) is usually the trainer of choice. For those students who are taller or may just want more room, we also give primary instruction in the Piper Warriors, Piper Archers or Cessna 172 (4 seat) aircraft. It is recommended that you try a flight in each airplane and then make your decision. What is the difference between high-wing and low-wing aircraft? The primary difference is the view. Some people prefer to see above them, some prefer to be able to see below. Instruments and switches may be in different locations, but the basic flying skills are the same. All of our aircraft routinely go through annual and 100-hour inspections. We take pride in our aircraft and want you to be able to as well. Every effort is made to keep the fleet clean and in working order. We have a very capable in-house maintenance department at each location, so down-time is minimized, and problems can be addressed almost immediately. Ultimately, the decision is up to you, but we will attempt to pair you with an instructor that matches your personality, goals, and schedule. Spring City Aviation employs several instructors capable of providing training at the student, private, instrument, commercial, and instructor levels. Several of the instructors have been part of our team for more than two years, giving stability to our school. Some are former Spring City students themselves. That being said, we want you to fly with the instructor who best matches your personality and learning style, so if you would like to try a few different CFIs to find the best fit, we encourage that as well. There are several payment options available. Some customers elect to pay at the completion of each lesson. Cash, check, VISA, and MasterCard are accepted. Others choose to pre-pay and take advantage of our discount program. We offer a 10% discount on payments of $1000 or more (cash or check). and a 5% discount on payments of $1000 or more made by credit card. These discounts assume a zero or positive account balance. What is the ground school and is it required? 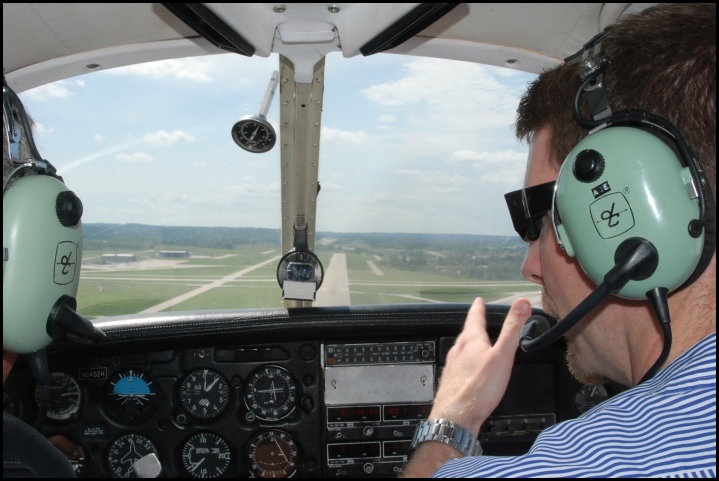 Spring City Aviation offers a Private Pilot Ground School several times per year. The purpose of the ground school is to prepare the student for the required Private Pilot Written Exam. The class is not required, but we do recommend it as a means of providing structure, motivation, and a time frame for completing the studying. The ground school can be completed prior to beginning training, but is more effective when taken concurrently with the flight training. On days when the weather is not good enough for flying (low visibility, low ceilings, or thunderstorms), students can still expect to come in for a ground lesson, or to utilize the full-motion flight simulator. Even after completing a formal ground school, there will be a lot of material to cover in preparation for your new Pilot Certificate. If my instructor is not available, can I fly with another instructor? While Spring City Aviation aims for consistency and excellence from its instructors, only your instructor will know exactly where you are in your training, and in which areas you struggle. Therefore, it is in your best interest to fly with one instructor for your training. However, as part of our curriculum, you will fly with the Chief Flight Instructor prior to solo, solo cross-country, and the final checkride. This is a double-check built into the system to insure that the instructor and student are on the same page. When can I start carrying passengers? During the lessons, a passenger could be carried if the instructor was present, but this is usually not very conducive to training. Carrying passengers without an instructor present is prohibited until you have a private pilot certificate. In accordance with FAA regulations, you must have obtained a certificate or completed a biennial flight review within the preceding 24 calendar months to be able to exercise the privileges of your pilot certificate. Also, if you wish to carry passengers, you must be able to show that you have done 3 takeoffs and landings in the preceding 90 days. Your pilot certificate never expires, but you may be required to do additional training periodically to keep your skills at an acceptable level. Once you have obtained your Private Pilot Certificate, you will be qualified to fly most single-engine land aircraft in decent weather conditions. An instructor may have to give you some additional ground and flight training in aircraft that you wish to fly that differ from your training aircraft so that you will have sufficient operational knowledge. You will be able to share expenses with passengers, but cannot charge for your services. You may travel to almost any civil airport in the U.S.and around the world. Spring City Aviation is a Part 61 school, which means that we develop our curriculum and our students must meet the previously mentioned time minimums established by the FAA. A Part 141 school has direct FAA involvement in their course structure. Students may have fewer requirements and have the potential to complete the training in fewer hours. In the end, it really does not matter which format you follow because the standards that the pilot has to be able to fly to are the same.